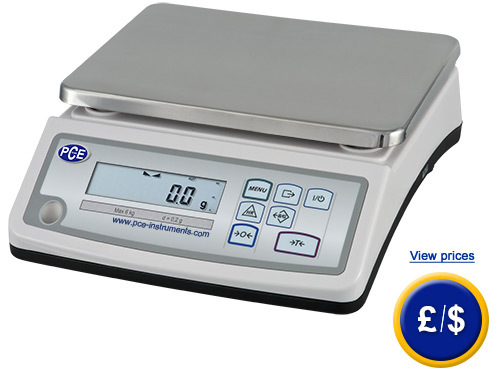 The benchtop scale series PCE-BDM can be used for different purposes. This benchtop scale is valued not only for its functions, but also for the possibility of communication. The RS-232 port of the bench scale sends the weighing value as readable ASCII code and can be controlled, which offers an excellent base for any programmer. The benchtop scale sends information automatically or by pressing the "Print" key. It sends about 10 values per second after the weighing value has stabilized. Another possibility to integrate the benchtop scale of the PCE-BDM in a system is via LAN port, USB, analogue output of 4-20 mA or 0-10 V or the limit weighing function with three cross-connection outputs. 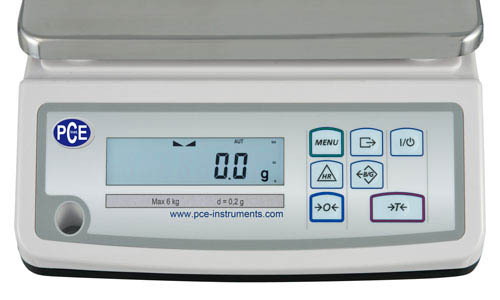 The benchtop scale has the following functions: counting, memory for 10 tares, percentage calculation, large print protocol settings, RS-232 port, auto-off, etc. The benchtop scale can be powered by both mains supply and battery, allowing this scale to be mobile. Through ProCell optional software you can import a data from the benchtop scale to any system that allows you to enter data with a cursor, such as Excel, Word, DHL, SAP, etc. The software simulates the data input. Here you will find an overview of the different types of benchtop scales and in the following link you will be able to find any kind of balances you need. Software is in German and includes the cable for RS-232 interface. The software is used for direct transmission of weighing results to computer with date and time. The data is stored in txt format. However, if you have only USB ports on your computer or laptop, you must use USB RS-232 adapter. The software runs in the background and serves to transmit the weight data in systems where keyboard input is possible, such as Excel, UPS, Word, DHL, SAP and many more, as a keyboard input is simulated by the software. If you have USB-Interface on your computer or laptop, you must use USB RS-232 adapter. The delivery of the software package icludes the data RS-232 cable. If you want to transmit data to a laptop or other mobile storage, you will need USB adapter (driver software is included). Thermal printer is used to print directly the values of the benchtop scale. The printer is shipped with RS-232 cable and 240 V network adapter, the paper width is 112 mm. The benchtop scale with a printer can print directly the weighed values on labels. The printer is delivered with RS-232 cable and 230 V network adapter. The width of the tabs is adjustable (max. 50 mm). For companies wishing to integrate their benchtop scale in internal quality control or to submit it to annual recalibration. The certificate contains a calibration according to ISO standards including all measured values. In the report the name and address of the company or customer are indicated. These weights are used exclusively for recalibration and checking the accuracy of the scale.